Each Saturday here at PhillyVoice, we like to offer up five over/unders for the upcoming Eagles game. But since they're off this week — and it just so happens to also be the midpoint of their season — we decided to take a longer view and give five numbers to watch for the entire second half of the season. What this number boils down to is simple: Will the Eagles be better in the second half of the season than they were in the first? It's tough to see more than five wins in there. Even if the Eagles go 4-1 in their remaining division games, they'd need to win two of arguably their three toughest games remaining (at NO, at LAR, vs. HOU) to get to 10 wins on the season. But there is certainly a path to winning nine games this season — and it starts with them coming out of the gate hot. If the Eagles can go 3-0 out of the bye, they'll be well on their way. But even a 2-1 start — especially if that one loss comes against either the Cowboys or Giants — will put them in a precarious position heading into their Week 13 Monday night game against the Redskins. From there, they have a rough three-game stretch that includes at least one primetime game against the undefeated Rams before a season-ending trip to Washington. And that's the game this whole category — and the Eagles' whole season — could come down to. I see the Eagles entering their season-finale at 8-7 on the year and needing a win over Washington to hit the over — and make it back to the postseason. And I believe Doug Pederson and his team, who have just a little bit of big-game experience now, get the job done in that one. After all the talk this summer about whether Carson Wentz’s torn ACL would slow his development in Year 3, it hasn’t taken very long for the majority of doubters to be turned into believers. Sure, his team is only 3-3 in his six starts this season, but it hasn’t been the quarterback’s fault. More often than not, Wentz, who is completing over 70 percent of his passes, has looked more like the guy who was the frontrunner for last season’s MVP than the guy who spent the offseason rehabbing from surgery. And that’s led to a 13-2 touchdown-to-interception ratio this season and a 109.6 passer rating. So what does the second half of the season hold? Well, that’s difficult to answer, for a few reasons. First, we didn’t get to see Wentz finish out the season last year, meaning we don’t yet have a clear picture of how he’ll play when it gets colder out, and the figurative heat gets turned up. That’s not, however, to say that Wentz won’t play his best football yet down the stretch — it’s just that we don’t know yet. Then there’s the question of the quality of the Eagles’ remaining opponents. While their schedule says it’s going to get tougher, the number actually suggest that things could get easier for Wentz. Four of their first eight opponents — JAX, CAR, MIN, TEN — rank in the top half of the league in passer rating against, while just two of their remaining opponents — WAS, LAR — can make that same claim. Finally, there’s the team aspect. Wentz can be as good as he wants, but without the help of the guys around him, he’s going to struggle. The Eagles bolstered their receiving corps by adding Golden Tate at the deadline (more on him in a second), but their offensive line continues to be a question with Lane Johnson sidelined and Jason Peters seeming popping up on the injury report every other week. Add to that a running game that has struggled without Jay Ajayi, and could allow defenses to key on Wentz and the passing attack, and you can begin to see how this is getting complicated. In the end, the hardest thing to do here might be to bet against Wentz. The way he's playing, it's hard to see him taking a sudden turn for the worse. Sure, he's not exactly the take-the-top-off-the-defense threat that the Birds were looking for, but that doesn't mean he won't be a big part of their offense the rest of the way. It's going to be extremely difficult for opposing defenses to stop all the weapons at Carson Wentz's disposal. The Eagles are going to have a tough time running the ball the rest of the way, but with the way Wentz has been throwing the ball, that might not be as big of an issue as you'd think. The opportunities will be there for Tate, and I think he takes advantage of it. So far, we've really only focused on the Eagles offense, but now it's time to switch it over to the other side of the ball. And, as you'll see, these last two categories are somewhat related. Through their first eight games of the season, the Eagles defense recorded 22 sacks, which ranks in the Top 10 in the league. Unfortunately, that hasn't led to a ton of turnovers (more on that next). And I don't see them getting more in the second half than they did in the first. Why? In part because of the loss of Derek Barnett, but also because Fletcher Cox, the motor who drives this defensive front, has been playing more this season than in past seasons. 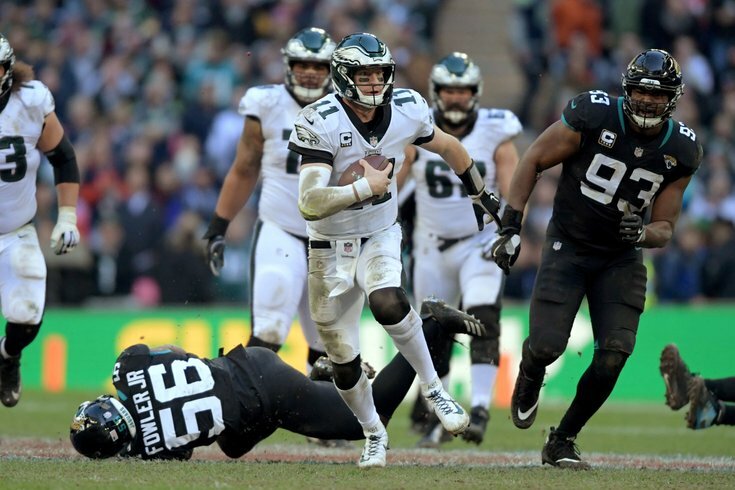 And coming off a Super Bowl season that included more games than usual, one can't help but wonder if that is going to come back to haunt the Eagles, even if Tim Jernigan returns at some point. It's almost mind-boggling to me that the Eagles have averaged less than a turnover per game so far this season after they were among the league leaders in takeaways a year ago. Currently, their seven takeaways (four interceptions, three fumbles) rank 24th in the NFL, and it's likely going to be a worse ranking after Sunday's games. There's no way the Eagles can win more games than they did in the first half if they don't improve in this category. Unfortunately, the Redskins, Rams, Saints, and Cowboys — their opponents for six of their final eight games — all rank in the top 10 in the league in giveaways this year and none has turned the ball over more than eight times this season. As much as I want to believe they'll turn it around — and in all honesty they can get halfway there with one big turnover-fest of a game (maybe against the Giants) — I just don't see it happening.